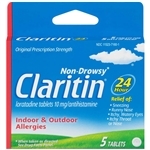 Claritin and Zyrtec make some great medicines that relieve terrible symptoms from allergies. 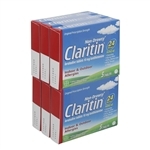 We sell full cases of allergy tablets for your healthcare centers and doctors offices. Looking to compete against the big drug stores, your gas station or convenience store can buy bulk cases of these and sell them in packs to your patrons. Zyrtec Allergy Tablets - 10 Ml. Zyrtec 24 Hour Indoor and Outdoor Allergy Tablets - 10 Mg.